Maaan... I can't part my hair for Shiznit! Any thick-haired 4A's got any suggestions? This aint braggin... I really need help... This sh*t aint fun or cute... my flat twists look sloppy. not the twists themselves but because the parts look so damn raggedy. Your siggy says you got a full head of 4A hair... can you help me! Are you doing them on wet or dry hair? This sounds good...would you be opposed to blowing it out then twisting? ok so stretch your hair and then braid your hair into cornrows, after that take them out, usually my hair is really stretched when i air dry in cornrows. what are duckbills? Are they like those metal clips? I've tried parting with those things... I can never do it straight. I even try with a rat tail comb.. i feel like it doesn't do a good job either... But I don't know how to cornrow btw.. I just learned flat twists.... I tried cornrowing... it was too hard and came out a HOT mess lol. This is a duckbill clip. Anyway, try doing it on freshly moisturized, soaking wet hair. Not damp, soaking wet--it provides just a bit more slip. And on that wet hair, try parting your hair into the sections with just your fingers first, and then pinning up each section (with a hair-tie or clip or something) so your hair actually stays in the sections. 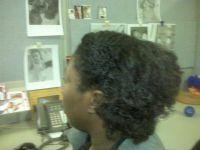 Then take down a section, and straighten/neaten the part up with a rat tail comb, and commence the flat-twisting. When you're finished twisting, repeat this process with each section; do this section by section. Make sure you keep your hair wet/moisturized throughout the styling; it makes the hair much easier to work with. HTH. you can part on wet or dry hair. I didn't say she couldn't part on dry hair or that wet hair was the only way to go. I'm just saying that wet hair might be easier to work with, especially if she's just learning how to do flat-twists. For my hair, the state of my hair when I do it is very important, and the results of styling on wet hair compared to styling on dry hair would most likely be completely different. i wish my hair was as thick as yours! :flower:i hardly ever do parts but if i do, i prefer doing it on wet hair with a rat tail comb. This is very similiar to the way I style/part for my flat twists. I wear flat twists like 80% of the time and everytime I do them they have to be on wet hair. At first I was using a regular comb to part but the rat-tail comb certainly does wonders! So I would suggest that you invest in one if you plan on doing any styling that involves neat parts. But yeah I'mma try it with wet hair once... And I'mma get a rat tail with a metal tail on it. We'll see how it works!